Visiting The Toronto Distillery Co. There is no substitute for visiting a distillery. Understanding distilling theory, and whole chunks of social history, greatly assists an appreciation of the different types of distilled liquors. But visiting in situ brings the reality home. I’ve had the opportunity to visit distilleries, and former distilling sites from which much can be learned too, in Kentucky, Tennessee, Scotland, Ohio, Pennsylvania, and Ontario. Recently I visited Toronto Distillery in the Junction area, south and a touch east of St. Clair Avenue and Keele Street. The nature of the still permits distilling-out at different proofs and with different “cuts” to separate out oils in the tails for example. Spirits are distilled separately from malted corn, rye, wheat and other grains, as well as organic beet root. The fermented mashes aren’t filtered for the boil, they go in as is and an agitator (stirrer) in the unit ensures no sticking or burning. In this sense the process is similar to American practice in bourbon country. In contrast, the Scots drain a wash from their mash and send that to the pot still, at least for malt whisky. A range of white spirits is produced and some are laid away for aging. There is also a golden-coloured applejack, blended in this case, which has a lovely fresh apple nose. A gin is also produced which offers soft floral/spicy notes. The rye spirit has a distinctive sharp, spicy quality that you can recognize in aged rye whisky as well. Of course aging in wood alters any spirit particularly when distilled in a traditional way to retain character from the mash, as all Toronto Distillery’s products are. Certainly none of the products I tried were anywhere near neutral! They all have a vigorous character which reflects the grains and other materials they issue from. The organic beet spirit has a remarkable nose and flavour of fresh beet, and would make a perfect spirit to add to cold borsht and sour cream. Heads-up to the fashionable restaurants of Toronto. 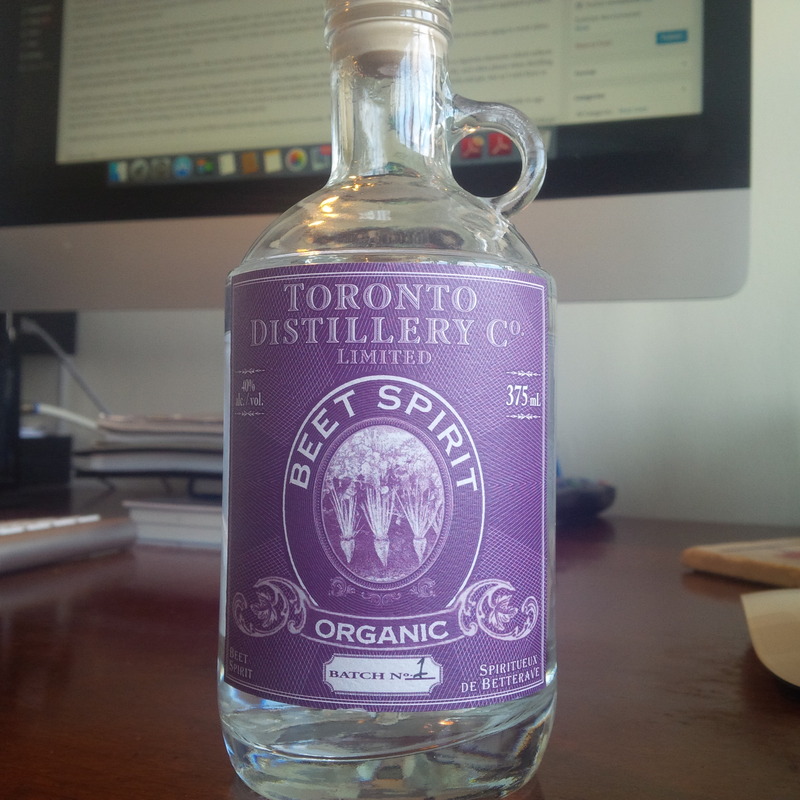 Incidentally, beet spirit was much produced in the 1800s and this is a welcome revival. The white grain spirits would be very similar to whisky made in small distilleries in Ireland, Scotland, Ontario, Kentucky, and other places when distilling was an artisan craft, before methodical aging came in. 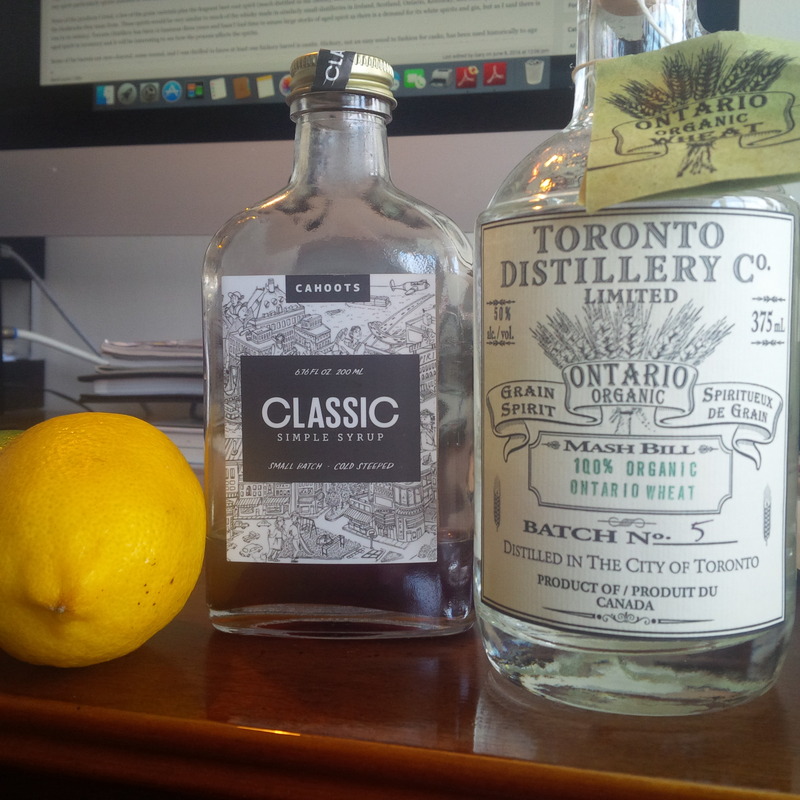 Toronto Distillery has been in business three years and hasn’t had time to amass large stocks of aged spirit as there is a demand for its white spirits and gin, but as I said there is aged spirit in inventory and it will be interesting to see how the process affects the spirits. I believe if held long enough they will age into fine brown whiskeys. Some of the barrels used are new-charred oak, some reused. I was interested to know at least one hickory barrel is onsite. Hickory, not an easy wood to fashion for casks, was used historically to age some spirits in America. The tradition was remembered in the name of the now-defunct brand, Old Hickory Straight Bourbon albeit the latter was aged in conventional new charred oak casks. In trying these single-grain varietals, it reminded me that spirit distilled for whiskey but drunk new is really in its own category. The acids, esters, higher alcohols and residual oils of traditional grain distillate are so distinctive, and change so much by a few years in wood, that it is not right to compare them in the two states. This ties in to how young spirit was consumed, say c. 1800 when oak aging was in its infancy including in Great Britain. This is in fact the origin of drinks like Drambuie and Irish Mist. Had fully-aged malt whisky or the Irish equivalent always been available, I doubt those early compounds would have emerged. But vigorous young white or little-aged spirit marries extremely well with many kinds of flavouring. Some years ago in a gathering of lawyers to taste different kinds of historical spirits, we tasted a specially-made punch which employed a white rye spirit. The recipe involved fresh pineapple and lime and was based on a recipe from Saveur Magazine, here. Numerous tasters said it was the best drink of the night and the other drinks were all well-aged, well-known brown spirits. The Saveur punch recreated a typical early American punch, as pineapple has been grown in hothouses in the U.S. since the late 1700s and was prized for use in drinks such as these. It was notable how well the white rye married with these other elements. If you used vodka instead of white rye, it wouldn’t have been half as good. The marriage of congeneric whisky and fresh fruits of a certain kind created a third and very pleasing taste. The use of Jamaican overproof and other white rums distilled at a low proof in punches of fruit juices and spices is a similar example. In fact if you use aged rum in lieu of the overproof it isn’t as good, the tannic acid doesn’t mix well with the citrus. I was in Saint Martin once and they favour there the ‘ti punch (or ponche), a feisty white rum with lime and sugar or syrup. Ditto in Martinique and Guadeloupe. I was told you can use dark rum, but most people prefer the white and I can see why, it tastes better with a clean, zingy fruity hit. *Note: Excluded from this statement is the company’s gin. Per the website: “the base for [the gin] is neutral spirit (‘pure’ alcohol, 95% alc./vol. ), which we source from Brampton’s GreenField Ethanol. Neutral spirit is best made in large continuous column stills, which run non-stop for most of the year and can produce neutral spirit with the most energy efficiency”. How Exactly Did Dr. James Crow’s and E.H. Taylor’s Whisky Sour Mash Work With No Yeast Added? Old Hickory Whiskey was named for Andrew Jackson, not to suggest the use of hickory barrels or hickory wood chips in aging the whiskey. The brand has been revived – see http://www.oldhickorybourbon.com/ . Thanks, this may well be, yet the wood was used for barrels in some cases to age whiskey. Maybe a double meaning.